Track professionals understand the need for absolute control. AP Racing understands how to give that same control to your Audi B5 S4! 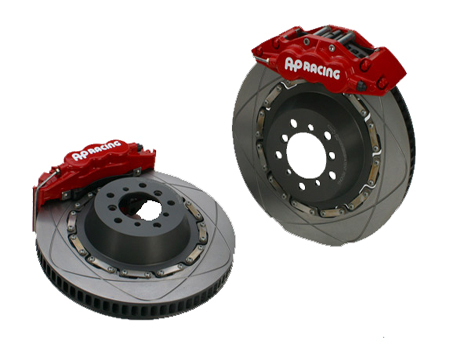 AP Racing's Formula Performance Brake Kits are designed for everyday road use and weekend track use. These kits reduce braking effort and give a more responsive late-braking confidence. Provides increased resistance to fade after repeated high speed stops at the track, AND is still able to cope with day-to-day motoring. These kits are based on AP Racing's championship-winning braking systems. You can now posses the same advanced brake technology found in Formula 1, NASCAR, World Rally Championship (WRC), Champ Car World Series, American Le Mans Series (ALMS), Grand-Am and more at an affordable price. *Kit is available in two configurations: Black Calipers with Yellow Script or Red Calipers with White Script.